) is a mobile suit from the U.C. (Universal Century) timeline, This Gundam first appears in the game (Gihren’s Greed). In the game Gundam Gihren’s Greed, one of the parallel timeline of U.C. Universal Century where Zeon Forces (antagonist) won the One Year War, the legendary Char Aznable will leave Zeon and start building up a new faction, known as Neo Zeon (different from the original of Axis Neo Zeon in ZZ gundam), to seek another ways to finish his revenge against the Zabi’s family. RX-78/C.A. is a new types and research teams from both Zeon Forces and Earth Federation. The research team combined and modified their knowledge in created mobile suits and built the RX-78/C.A., honoring the number of Earth Federation team’s superb creation RX-78-2, the new appearance of the unit is an exact duplication of it. 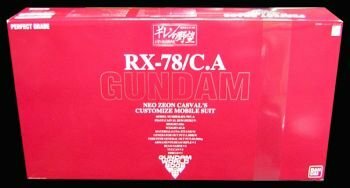 However, the inside of the Gundam unit used a lot of Zeon technology and is completely uniquely different from the original RX-78-2. In the time during the development of this Mobile unit, the fine tuning used the data of the mighty Char Aznable and there for it is just like a custom unit built just for him and also painted red. World record showed that this unit has encountered a several combat with the white RX-78-2 Gundam. Vulcan Guns, 60mm Gatling Cannons. This Vulcan guns were 60mm Gatling guns equipped on the sides of the Gundam’s head. Beam Saber. Standard equipment for every Federation mobile suits, Beam Sabers are often used for meele close range combat. Beam saber are normally stored in the backpack component when unused. Beam Javelin. The beam javelin armaments is an alternative to the beam saber, it has a higher strong output than the standard beam saber, and the beam’s design allows for a greater amount of armor penetration ability. Beam Rifle. The beam rifle Gundam is the primary weapon used by the Gundam. Hyper Bazooka. The Hyper Bazooka is a very heavy weapon used by the Gundam. Gundam Hammer. A rather unusual weapon, this is the secondary weapon,the Gundam Hammer was essentially a large spiked ball attached to a chain. Shield. Hand-carried, defensive, forearm-mounted or stored on the Gundam’s backpack, the Gundam shield is a simple defense used to block most incoming strike, ballistic and explosive projectiles.